Manage the System settings within your testing environment in the SentryOne Test Web Portal System Settings tab. Annotations allow meaningful descriptions to be assigned to tests. These can be useful when business users are trying to make sense of test results on the SentryOne Test Web Portal, and appear on the test management page for a test. Note: Annotation types can also be created in the Visual Studio Extension. For more information, see the Visual Studio Extension Integrating with the Remote Agent article. LegiTest.Description Description Displays a user entered description for the Test object or assembly. LegiTest.ResolutionSteps Resolution Steps Displays the user entered resolution steps for the test object or assembly. LegiTest.UserErrorMessage User Error Message Displays an error message for the test object or assembly. Note: The default Annotation Types within the SentryOne Test Web Portal cannot be edited or deleted. 1. Select New to open the Add Annotation Type window. 2. Enter a Type Name, and Description for your Annotation Type, and then select Save to create the Annotation. Edit custom Annotation Types by selecting . Save the edits made by selecting or cancel by selecting . Manage the users and organizations within the SentryOne Test Web Portal via User Settings. Select your organization name to open the Organization window. Select an organization from the drop down menu and then select Ok to apply the changes. Select to open the User Options context menu. 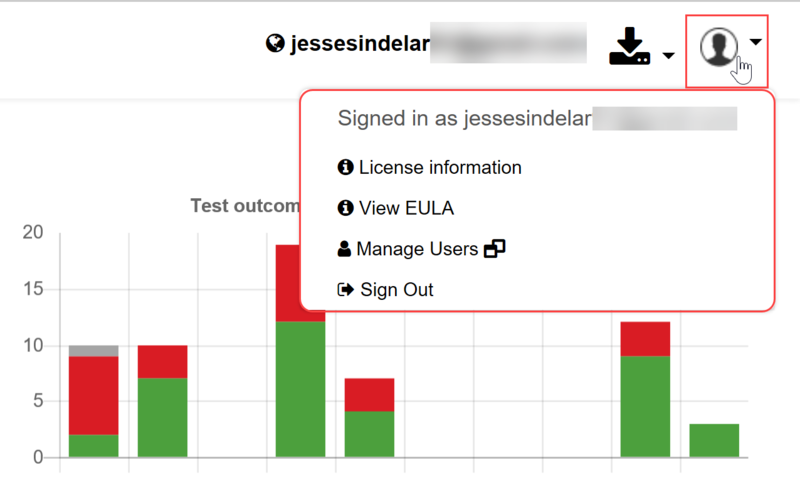 Opens the License Status page which provides details about your SentryOne Test license. Opens the End User License Agreement for SentryOne Test. Opens the SentryOne User Management page. Select Manage Users to be able to Add new or manage existing users for your SentryOne software. Log out of the SentryOne Test Web Portal.